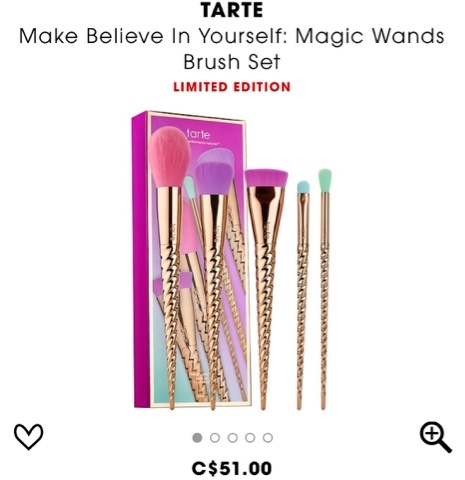 It's the last day of the Sephora VIB sale and there's still so much that I want.. but I scaled way back and made the most boring of purchases this time around.. The sale takes place twice a year and I ALWAYS forget its coming until its here.. I think if I can, I will start a scrappy little savings account right now for the fall sale. what that means: VIB, you have spent C$350 / US$350 in one calendar year. VIB Rouge, you've spent C$1,000 / US$1,000 in one calendar year. Sign up here (it's free). 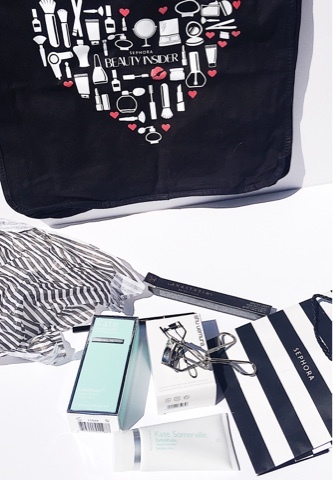 April 18-24: VIB Rouge 15% off in store and online with the code ROUGESPRING. April 19-24: VIB 15% off in store and online with code VIBSPRING. 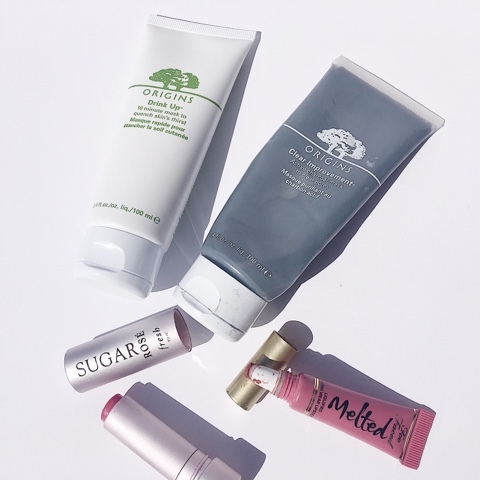 April 20-23: Beauty Insiders 10% off in store and online with the coupon code BISPRING. I'm realizing now this info would have been much more helpful about a week ago... but I'm way behind on my blog game! I'm sorry. I have 200 drafts and no finished product. like most shopping trips I went in with a splurge in mind but my practical side took over! I was most interested in a very fine exfoliator.. I was going to lay down a pretty penny for one but they didn't have any of the kinds I had researched in store. 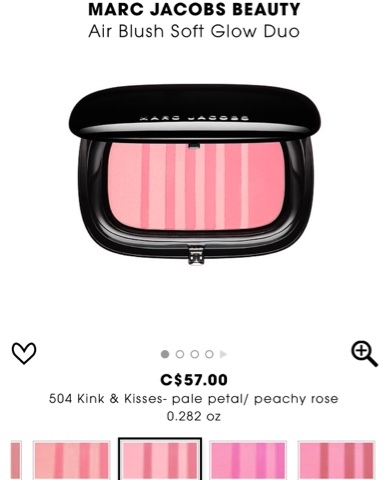 so after chatting to the crew (Sephora employees lol) I decided to go with the Kate Somerville ExfoliKate. I've been using it for a week now and I am really happy! I would repurchase this product but I think I could also experiement with a bit cheaper options first (see below). 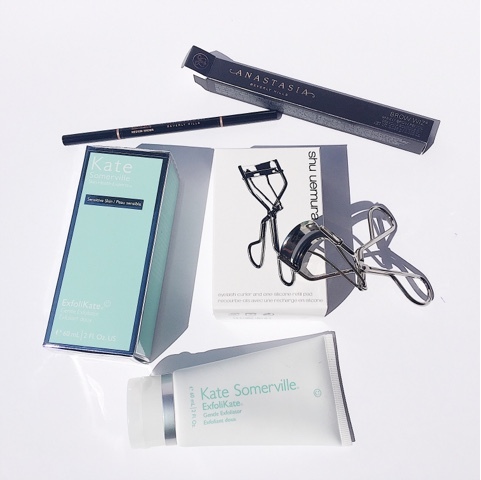 The Kate Somerville ($80) was very cleansing, seems to even out my skin tone and decreased my Milia..
Sheesh, don't google Milia without bracing yourself..
some of the photos are graphic. I have a few spots on my cheek that are not that pronounced.. I notice them myself but to the naked eye I don't think they would look like much, if anything more than a tiny breakout. 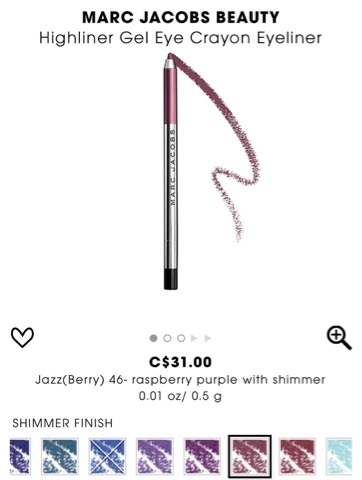 I also picked up a spare Anastasia beverly hills brow wiz ($27) because it cannot be beat! 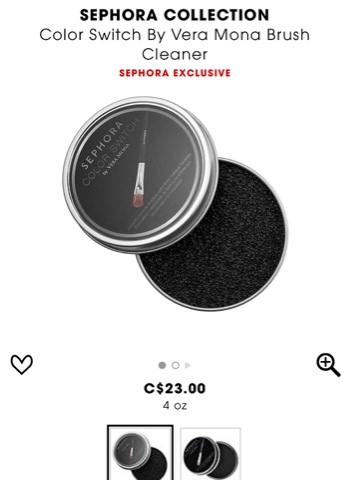 I was tempted to try the Sephora retractable brow because they look nearly identical! but after swatching, it seemed a tad waxier so I thought "better safe than sorry". 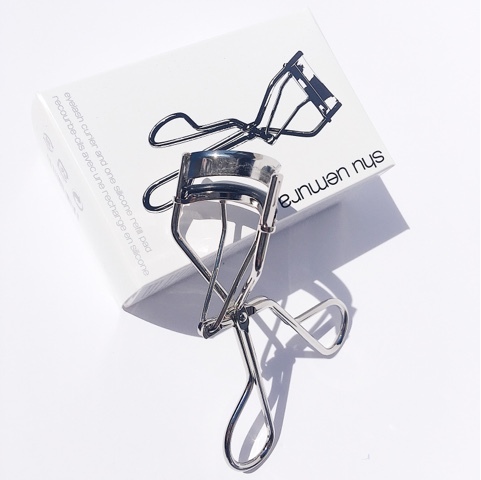 The last purchase was the Shu Uemura eyelash curler.. I know, so boring! but I desperately needed a lash curler and I've wasted a pretty penny on curlers that just didn't last, broke my lashes, didn't fit my eye shape etc. 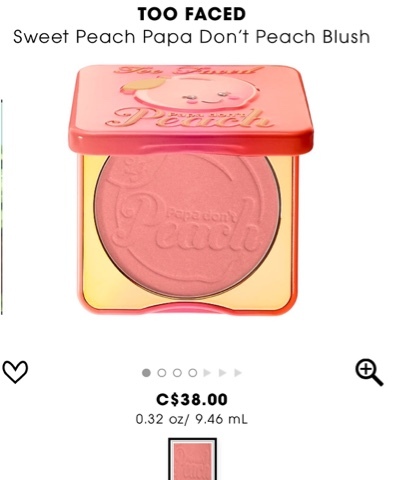 Since the Shu ($25) is surrounded by rav reviews I figured it would be my best bet.. 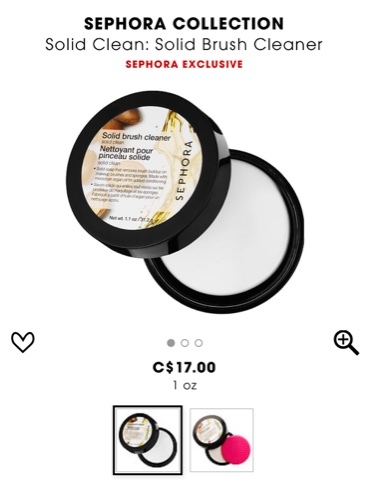 I spent a few minutes looking at the Sephora brand curlers, they had a ton of options with great descriptions but I hadn't done any research on them so I decided to skip out.. I am really pleased with all my purchases and don't have any complaints. There were SO many things I wanted but we know how easy it is to get carried away. If the budget was unlimited, here's some of what I had in mind.. Origins Charcoal mask $32 : I'm on my last few uses of this and will be repurchasing, it really deep cleanses and refreshes. Origins Drink up mask $32 : This one moisturizes but is not heavy, love it. I'm actually newly obsessed with Origins and will be broadening my use of their skin care, everything I've tried so far has been great and is fairly priced for higher end skin care. 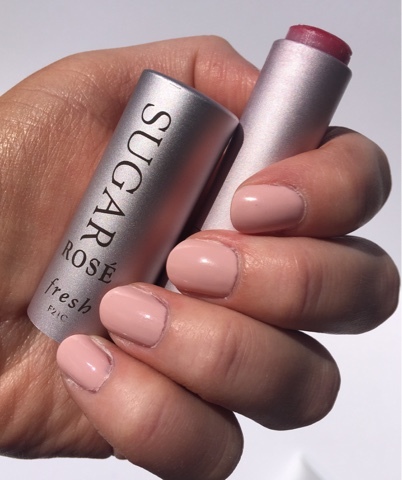 Fresh Sugar lip treatment $29 : these tinted lip treatments are just so good! Its the kind of chap you keep in every coat pocket and use on the go. It always brightens up my face and I don't need a mirror to apply. I want 12 more of these to hide around my house! 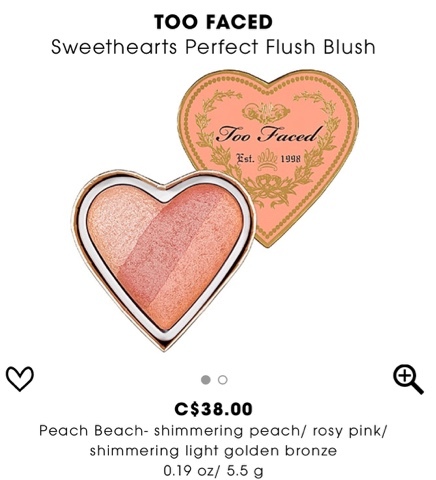 Too Faced Melted lipstick $25 : These are a long love of mine, I lost my melted berry and I desperately want another, plus there's a melted strawberry that is a sheer-ish red shade and I would love to pick it up! This ^ is the other exfoliator the crew recommended and its a HUGE bottle for the price! 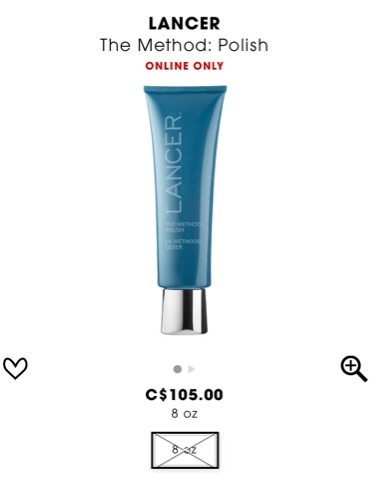 Lancer, it says online only but it was at Mic Mac Mall so worth trying to get in store or at least ask for a sample! I cannot believe we are at 31 weeks! thank you father time! I had my doctors appointment this week.. it was suppose to be last but I was too sick so I had to reschedule. I felt much better this day so I was relieved! I checked in and went to pee/weigh myself. Did I happen to tell you guys how this doctors office works? 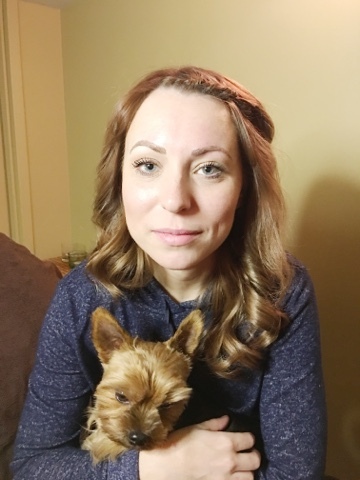 You know I've been struggling with weight gain this pregnancy and I will tell you, I made it a point to be more conscious in the food and exercise area. Now I didn't go CRAY.. I've still been reckless but I cut out ALL drinks except tea and water. I honestly LOVE water and drink it excessively but for some reason when I'm pregnant I love all other drinks! ICE TEA with both pregnancies I could power gallons of ice tea daily! Its terrible! So I cut out drinks and I tried to move more, not tons but more. Instead of asking someone to hand me something, I would get up and retrieve it myself. heck just refilling my water glass 10x a day keeps me busy. Everything must have paid off because I actually lost 3 pounds this month! So my 200 pound goal still stands! I weighed in at 187. I have still been struggling hard with what to wear. I am honestly in such a depression about it. 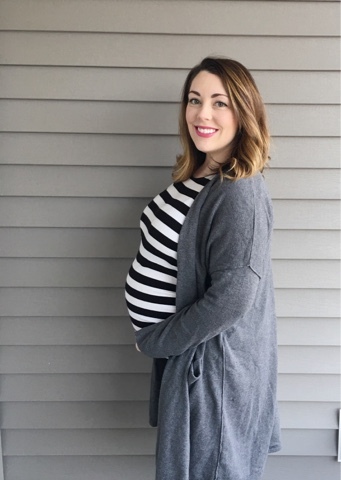 I've been searching high and low for affordable, stylish maternity wear and there is little to none available. heck, I would even fork over an OK amount if it was something I could get a lot of wear out of but there's almost nothing! forking over a decent amount to me is the $50-100 per piece range. I really can't go beyond that per article of clothing.. I mean its maternity wear! I only have 8 weeks left to really get my monies worth. so I've been feeling down and out about that. I have a vison in my mind of the cute pregnant women I want to be but at 187 pounds there's nothing! The maternity focused stores I swear, are catering to 50 year old pregnant ladies.. I just don't get it. but then I returned it! 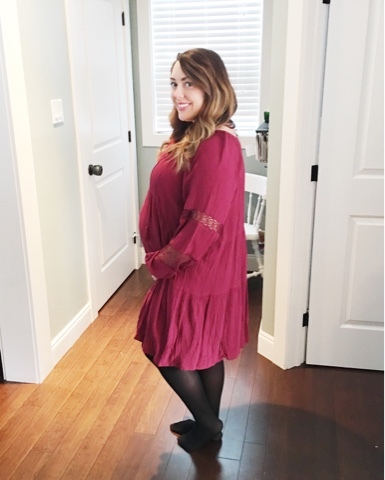 It is super cute, I love the colour, style, everything but I had to buy it 3 sizes up to fit the belly because its non maternity.. and I just wasn't comfortable with how it made my arms and neck line look. It was way too big in those areas. If you do love it you can find it here at Old Navy. A big win this week was my first delivery info finally being sent to my new doctor, I requested that forever ago and she finally received it from Newfoundland. Honestly I was very. very unhappy with my first delivery experience, I'm sure I've rambled about it enough for everyone and their dog to know! but to finally read exactly what went down was nice. turns out Newfoundland really didn't tell us anything! My new doctor read the report to me and I was like "oh wow"
Elliott's heart rate was erratic the entire time and they kept it monitored. I came down with a fever and they gave me some antibiotics. During delivery Elliott's head was tilted, not straight in the birth canal so that's why I couldn't get him out, his heart rate then dropped WAY too low and that's when they used the forceps but couldn't get him. so they used the vacuum and that straightened his head and then they were able to grab him with the forceps. I mean it was all SUPER crazy during so I get they couldn't give us the play by play but we kept asking what was happening and the staff totally ignored and whispered between themselves. I feel so much more comfortable with my current doctor and... she did give me a C-section date - YAY!! we spoke about it more and decided that was what is best for this situation and I couldn't be happier! She will be the one preforming it and I am so pleased! I am still obsessed with the current style/look going on this season! florals and hippy wear, I'll call it. 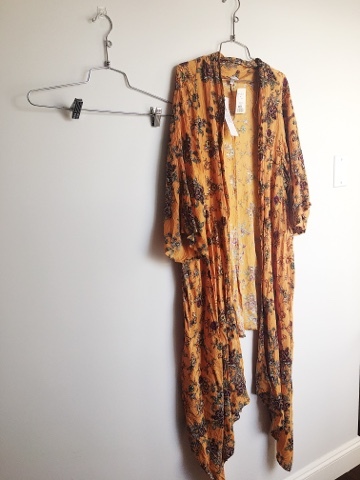 I thought it would be nice and comfy for hospital/postpartum, it is basically a housecoat! I would own 1000 more of these if I could but jeesh even spending $29.99 kills me these days! 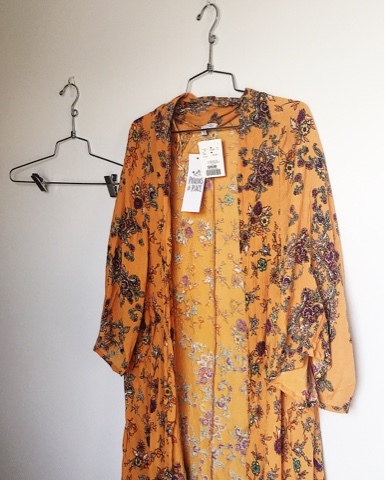 If its a piece I LOVE I will shell out the cash but for a casual kimono I am hard pressed to pay $29! now my one stay at home outfit is at a $200 cost! I remember being SO excited when CND came out with their first non UV light 'shellac' style polish. We were still living in Newfoundland so I searched the internet far and wide until I could get some shipped to me. It wasn't cheap and I waited impatiently..
finally they arrived, I used 'em and...................... "meh". I was pretty let down.. I had expected big things. a nice solid, streak free application. long lasting, chip free, easy maintenance. they were "meh" at best.. I liked the colour variety but they didn't apply nicely, were streaky, non opaque and didn't seem to hold a lasting stay any longer than your average polish and top coat. that had to have been 3-4 years ago. 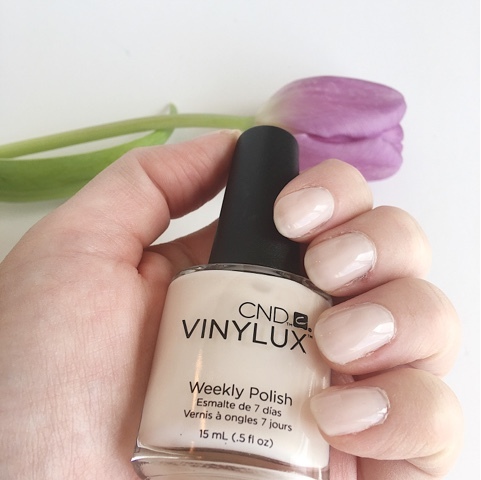 recently while doing my Shoppers Drug Mart rounds I noticed Vinylux had made a come back and was being peddled on all the end caps. Of course I got sucked into the gorgeous spring shades and before I could say shellac I had popped one in my basket. I questioned my sanity spending that much on a nail polish but I HAD to know if the formula had improved over the last few years. I couldn't find the price online and of course amazon, etc. prices vary but I know I spent between $13-15 dollars on this one polish. I remember it being a hit to the wallet. and honestly I'm not sure how to describe it! It keeps changing in every light, sometimes its pink, purple or grey. to me it is still a very pretty neutrally shade, just enough. 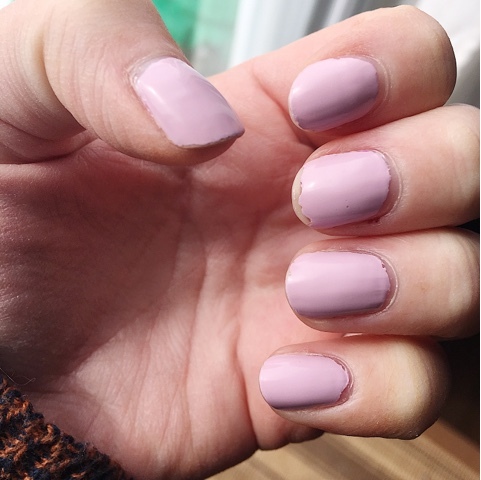 I painted my nails and was pleasantly surprised, the colour went on well and opaque. I HAD to finish with my seche vite top coat, I had to, I just HAD to. ever since I started top coating, I will never ever go back. 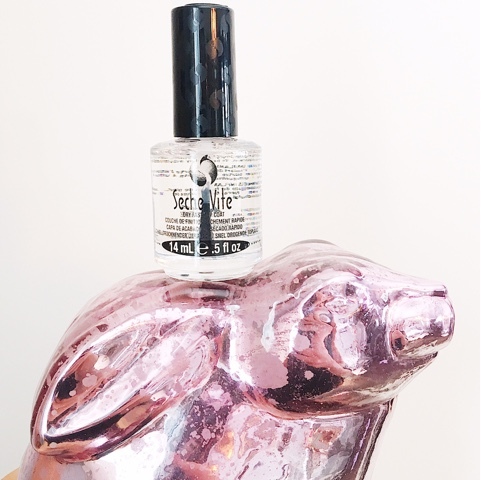 Seche vite use to be the BOMB top coat about 3-4-5 years ago, everyone and their mother was talking about it. Its lost a bit of its drive with all the great top coats coming out but its still a classic favorite of mine. so this photo is exactly after one week of wear! I was really pleased with the wear and minor chipping. currently I am at home with Elliott most days so I'm not a great example of wear if you work with your hands or are typing 24-7 but I do wash my hands compulsively! pregnant and a 2 year old, I wash my hands every 5 minutes I swear! so the final word is.. it was good. I really liked the shade selection and the wear was good. it wasn't mind blowing.. but it was very good. would I go out and purchase more...? maybe if I saw a HAD TO HAVE colour. but honestly all labels seem to have Amazing colour range lately! so I don't regret the purchase but it will take another 'sucker me in' shade for me to shell out the extra few dollars on Vinylux. 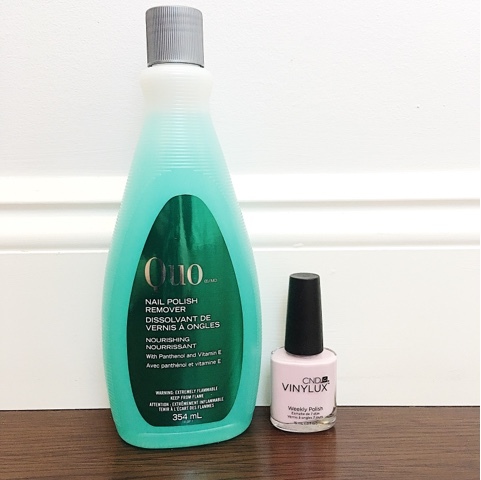 I'm telling you a top coat over any polish will extend your nail life, 2-3 days easy. just out of curiosity, I grabbed one of the shades I purchased a few years ago and yuck. I was still annoyed by it! It clung to my cuticles, looked streaky and just didn't please me. 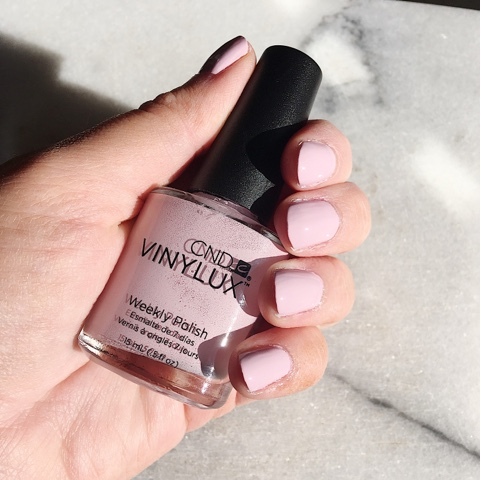 I LOVE this shade in theory and from a distance it looked ok but it didn't wear as well as my new Vinylux purchase and I removed it after a couple of days. 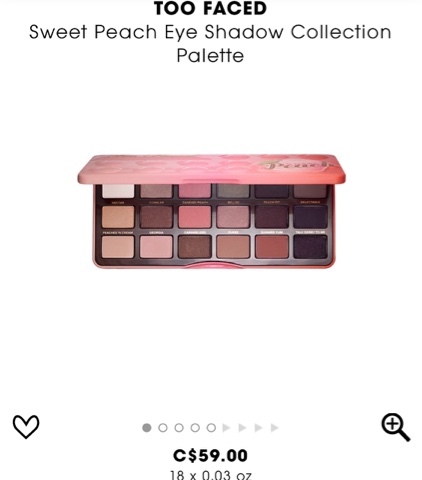 the other shades I purchased years ago are all over the map, some dark/vampy and some pink or coral but like this Romantique shade they just don't sit well. 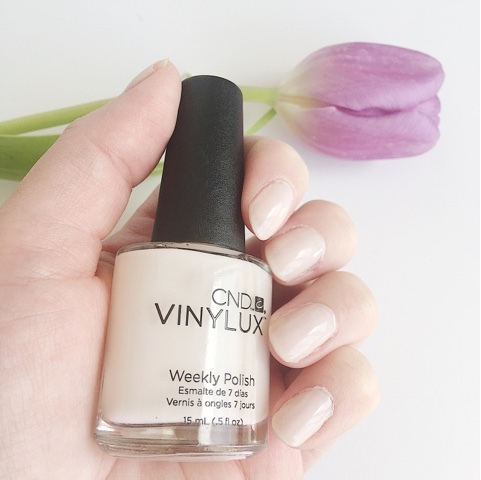 I received SO many comments from people about the Vinylux and the results really seemed 50/50! I think people are expecting a miracle polish since that's the impression they seem to be sending but its no miracle. good, pretty good, great maybe, but in a world of great polish its middle of the road- fo sho. If there's a colour you love - go for it! but you may find a similar shade from Essie, Revlon, OPI for a couple bucks cheaper. just FYI: I cheat on every polish I own! there is not a single brand or label I would say is my ride or die.. I'm still searching for the HOLY GRAIL of polishes! I've tried everything from high end to dollar store and with the exception of some dollar store shades staining, I have to say I would be hard pressed to pick a favorite! are all polishes made equal?! I'm dying to try a Chanel or Burberry but I can't commit that kinda cash yet. If you feel like I've dropped off the face of the earth.. 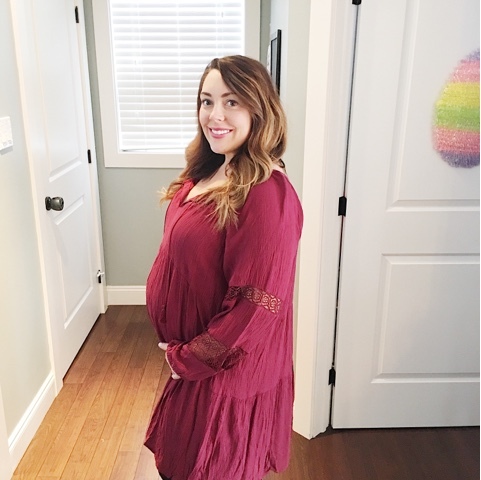 I have been back to severe morning sickness, so much so that I had to cancel my doctors appointment today! I just couldn't toss my cookies in that waiting room, so I've been rescheduled for next week. I was going to take a nap this afternoon but after moping around all morning and feeling sorry for myself I pushed open the laptop and I'm making myself blog! I have SO many blogs in mind, I want this motion sickness to bugger off so I can write! 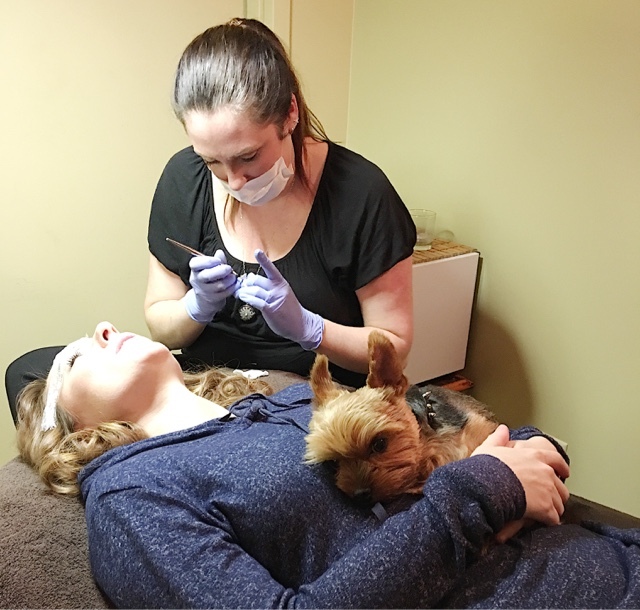 a couple of weeks ago I had the pleasure of attending my good friend Kate's eyebrow microblading appointment! - and it did not disappoint! 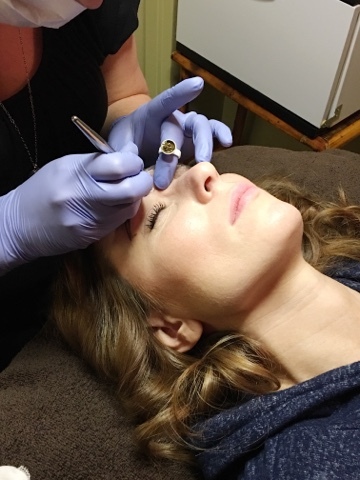 If you're a nosy YouTube viewer like me, you may have heard of microblading and maybe watched some videos/read articles about the semi-permanent eyebrow "tattooing". 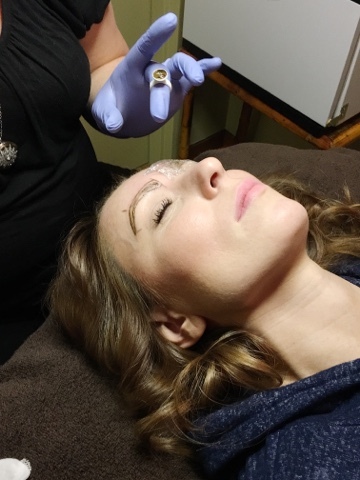 It is seriously all the rage and I've seen so many friends/influencers get theirs done. I want my brows done so badly but I am a complete wuss so I was happy to attend and see the whole process in real life, before committing myself. and really, truly there is not much to it! I was shocked at how fast and painless it all seemed. I'll break it down with photos below.. The first maybe 45 minutes - 1 hour were spent mapping out the brows. Breagh had this ruler style device and made sure all the angles lined up. to be honest this part had me worrying.. I am like Kate, and let the professional's handle things whenever I get a procedure done.. I don't really bring a whole lot of expectations or guidelines..
like when I go to my hairdresser I say "here I am! what do you think we should do today?" and let her pull the reigns.. I've only had positive experiences, I can't think of many things I regret..
but brows are SO personal.. I hadn't looked Breagh up on Instagram yet so I was chewing my lip in anticipation..
some microblading can be so harsh, sharp looking, too runway.. If that's the look you want, great! but I am a more natural brow girl.. I was worried they would be.. BAM BOLD. *especially if you are going from a very fine or non existent brow. 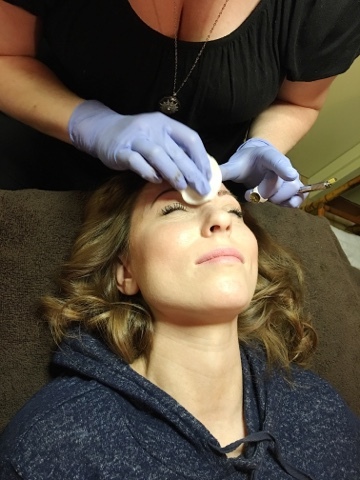 but my worries were curbed almost immediately..
After they're marked a numbing cream is applied, you wait 20 minutes then she starts making brow like strokes and I was surprised at how fast everything took shape. 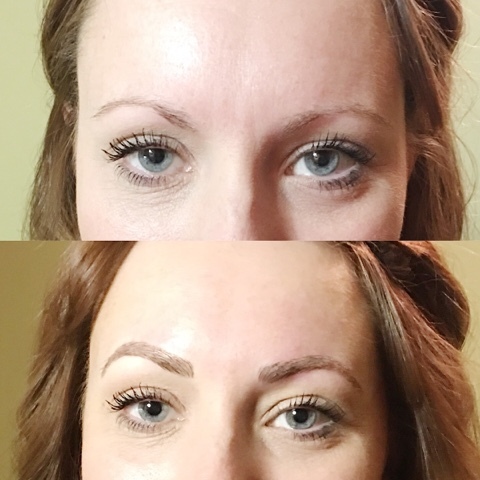 once she started, the brows were almost immediately there! the fine hair like cuts are made and filled with colour. Breagh mixed it up to compliment Kate's shade/colouring but there are MANY colours to choose from, so its very customizable to your wants/needs. I've heard that this tool is a multi needle device but to be honest it just looked like a small scalpel. It scrapes just along the outer layers of skin, short hair like stokes where the colour pigment gets deposited. I expected at least an initial wriggle but she was solid in her serenity. I want to say about an hour went by and the brows were almost done! the shaping was done, some additional colour gets rubbed into the brow and they're wiped clean. The after brows looked so. good. these are brand new freshly bladed and they were barely red or irritated! you won't be able to wear makeup for a week and you'll want to keep them covered with Vaseline especially during showers, you don't want to risk losing any of the pigment while they heal. they will also need a touch up session 4-6 weeks later. Once the healing is done the colour will adjust/fade so make sure you have a follow up appointment booked to keep everything on point. then you're done with your brows for the next 1-3 years. no more pencils, waxes, or filler. just wake up and have beautiful brows! As you can see Breagh did the perfect natural brow look, this is the exact brow look I would want for myself. I was so impressed! 3 hours total and Kate's brows were perfect. - would I lose my own brow? - would they look the same as before the blading? 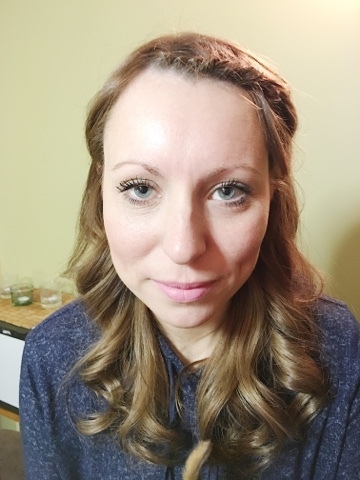 She said they would look very simailr, over time our face shape changes so its very hard to predict exactly how your brows may look years from now but she said she's seen the fading and it looks good.. sort of like hair dye fading/grow out, your brows just slowly morph back to their beginning state. The ink is not inserted as deep as a tattoo ink so over time, skin renewal, cleansing, the colour pigment just fades away. Prices vary from location to location but on the Interlude website it says $600 for the full brow. 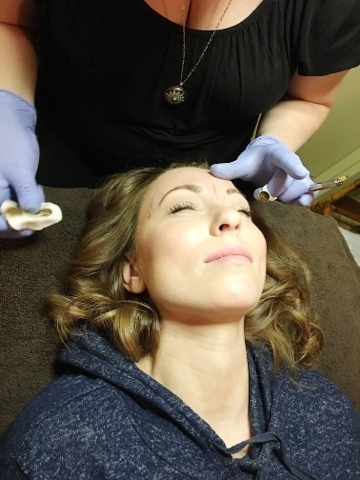 You want to make sure you go to a safe and clean environment, I see on some buy and sells discount microblading etc. 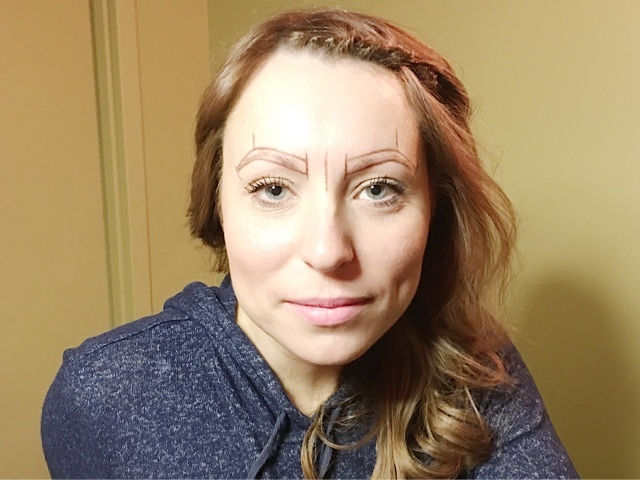 and like a tattoo, microblading is not something I would skimp on. like I said, brows are personal! go for a consult and really shop around, it is a hefty investment but the results can be amazing! oh and make sure you ask if the prices quoted cover the follow up appointment as well, you want to be prepared and not get smacked by any additional cost. I want mine done now more than ever! I feel like if I had sweet eyebrows and a lash perm, I would wake up every morning feeling fine! 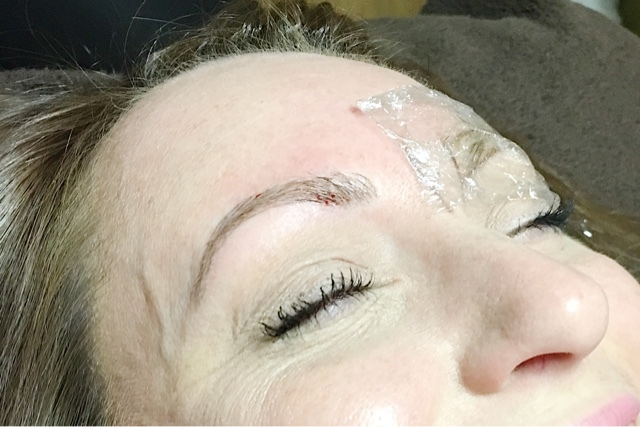 Let me know if you had microblading done, what you thought of it, how bad really is the pain??! ?